Monday: 8:30 a.m. - 11:30 a.m.
On February 25th, the Cleveland City Council unanimously approved a one-time donation of $5,000 to the Museum Center at Five Points to fund the Mayor Emeritus Tom Rowland Exhibit. The City of Cleveland will operate regular business hours today, Tuesday, January 29, 2019. We ask those traveling in our city this morning to use extra caution. Public Works is monitoring the roads and will salt when necessary. Do you have a Christmas tree you need to get rid of? The City of Cleveland will collect residential garbage scheduled for Thursday, November 22nd on Friday, November 23rd and garbage scheduled to be collected on Friday November 23rd on Saturday, November 24th. Nashville, TN: Governor Bill Haslam has named Cleveland Mayor Kevin Brooks to the Tennessee Advisory Commission on Intergovernmental Relations. The Cleveland City Schools Board of Education held a dedication ceremony for the Colonel (Ret) Tom Rowland Air Force JROTC Classroom at Cleveland High School this morning. Cleveland High School is the first school in our region to offer a JROTC program. In a joint release, the Bradley County Sheriff’s Office and the Cleveland Police Department announce the capture of escaped Bradley County juveniles Memphis Smith and Abraham Augustin. $1,000 REWARD FOR INFORMATION LEADING TO THE APPREHENSION OF JUVENILE ESCAPEES! The Cleveland Half Marathon in Cleveland, Tennessee, has been chosen as the 2019 Road Runners Club of America (RRCA) Half Marathon Southern Region Championship! CLEVELAND, TN – The City of Cleveland in partnership with Mainstreet Cleveland has created an interactive web map for this year’s Halloween Block Party in downtown Cleveland. CLEVELAND, TN – This past weekend the city of Cleveland's Stormwater Division co-sponsored the 30th annual Tennessee River Rescue Stream Cleanup in Cleveland. CLEVELAND, TN –The city of Cleveland's Stormwater Division is a co-sponsor for the 30th annual Tennessee River Rescue Stream Cleanup in Cleveland. CLEVELAND, TN –Beginning Tuesday, September 04, 2018, Deer Park located at 475 17th Street NW, Cleveland, TN 37311 will be closed for renovations. CLEVELAND, TN – The Cleveland Stormwater Division and Bradley County Stormwater co-sponsored a stream cleanup on Saturday, August 18th from 9:00 a.m. to 1:00 p.m. along the Cleveland Greenway. CLEVELAND, TN – The city of Cleveland is proud to announce the grand opening and open house of the city’s newest fire station. Cleveland Fire Station #6 is located at 2190 Westland SW, Cleveland, TN 37311. CLEVELAND, TN –Cleveland Fire Chief Ron Harrison selected Pete VanDusen as the Cleveland Fire Department’s Deputy Fire Chief. CLEVELAND, TN – Charter Communications joins local leaders to discuss internet resources for seniors in our community. CLEVELAND, TN – Cleveland added a new section to the greenway system Tuesday. The Casteel Connector links North Ocoee Street to Tinsley Park and the Cleveland/Bradley County Greenway. The City of Cleveland is seeking a Computer Technician to join our Information Technology Department. CLEVELAND, TN - The city of Cleveland received a $674,190 Transportation Alternative Grant Tuesday for its 25th Street Corridor Area Multi-Modal Project. A Cleveland street has been named for a woman who played key roles in the planning, construction and opening of the Cleveland Regional Jetport. A monument saluting the memory of William “Bill” Norwood was unveiled Saturday in First Street Square, a Cleveland city park. Please be advised: On Monday, June 11th, Norfolk Southern Railroad will be finishing infrastructure improvements along the railway. Crews will be working at the intersections listed below. The city of Cleveland’s Parks and Recreation Department is offering free swim lessons this summer. Our swim lessons will be taught by our certified swim instructor, Kelly McClanahan. Registration for summer swim lessons begin May 28th. The city of Cleveland will be closing a section of Parker Street beginning Monday, May 14, 2018 at 7:00 a.m. for road and sidewalk improvements. On Thursday, May 10, 2018, Cleveland Police Department's Sergeant Evie West was featured on News 12 Now as their First Responder Hero this month. Cleveland Utilities will be closing a small section of Keith Street (US-11) beginning Thursday, May 3, 2018 at 9:00 p.m. to Friday, May 4, 2018 at 6:00 a.m. for the installation of new traffic signal infrastructure. Cleveland was featured in the March/April 2018 edition of Business View Magazine based on Cleveland’s economic development and community spirit. Olivia Workman was Cleveland Mayor Of The Day when the City Council convened on Monday, March 26. The City of Cleveland has received its 20th consecutive Distinguished Budget Award from the Government Finance Officers Association Of the United States and Canada. The opioid crisis in Southeast Tennessee brought together community leaders and state legislators from the four counties of the Tenth Judicial District on Friday. New signs to the entrances of Red Clay State Historic Park were revealed Wednesday. The signs, in English and Cherokee, point out that Red Clay is part of the Trail Of Tears National Historic Trail. The city of Cleveland has begun to give Cleveland’s Deer Park a fresh, new look.Cleveland Public Works crews are in the process of installing a sidewalk system in the park this week in advance of other new features planned for later this year. The City of Cleveland is pleased to announce the winners of the 2017 Capture Cleveland Photo Contest. Sixty participants submitted pictures for the contest. The winners were announced at the December 11th Cleveland City Council Meeting. On Thursday, Cleveland honored the memories of those who perished at Pearl Harbor 76 years ago and the survivors of that day when Imperial Japan attacked the United States. The bridge at the 17th Street and Keith Street intersection has some new art work. City Hall Offices will be closed on Thursday, November 23rd and Friday, November 24th in observance of the Thanksgiving Holiday. Offices will reopen on Monday, November 27th at 8:00 a.m.
Cleveland’s Blythe Oldfield Community inaugurated the city’s newest park this past weekend. Area veterans were honored by Cleveland and Bradley County with a Veterans Day salute at First Street Square. Lee University will welcome Olympic-medalist and America’s greatest ever distance runner, Meb Keflezighi, to both run and speak at the 18th annual Great Strides weekend March 2018. An additional section of 15th Street is being renamed by the city of Cleveland as Billy Graham Avenue. Due to the historic nature of the Total Solar Eclipse event that will be occurring on Monday, August 21st, The City of Cleveland will close city offices at noon. Our office will re-open on Tuesday, August 22nd at 8:00 a.m.
A section of 11th Street from Church Street to Parker Street will be temporarily closed on 8/18 from 8:00 AM to 6:00 PM, 8/19 from 10:00 AM to 8:00 PM and 8/20 from 7:00 PM to 11:00 PM. Beginning August 6th our city pool hours will change. Make sure to stop by before summer's end. August 20 will be the last day Tinsley Pool is open during this summer. Cleveland, TN – A new history marker has been installed at the site of the former Allen School. The old school location is where the City of Cleveland Department of Public Works is now located on Second Street SE. Cleveland, TN – A fundraiser was held on July 11, 2017 to help raise money for a fly fishing trip in Montana for Colton Malone. Colton is the son of City employee, Ryan Malone. Cleveland, TN – A cooperative project between Bradley County and the city of Cleveland aims to create a safe access across a busy intersection to several outdoor recreation opportunities. A section of Centenary Avenue from Harle Street to Ocoee Street will be closed to thru traffic on Thursday, June 29, 2017 from 8:00 AM to 8:00 PM. Non-local traffic should use an alternative route. Cleveland began a new greenway section Wednesday with a groundbreaking ceremony for the Casteel Connector. Cleveland launched a new series of free summer entertainment plus a new downtown arts destination Friday evening. In Celebration of National Public Works Week Mayor Tom Rowland, City Manager Joe Fivas and Assistant City Manager Melinda Carroll recognized the extraordinary endeavors of the Public Works Department by hosting a breakfast for public works employees. A dedication and ribbon cutting ceremony marked the official opening of the Mayor Tom Rowland Interchange. Cleveland, Tennessee is celebrating its 25th consecutive year as a Tree City USA. The Mayor, members of the City Council and City Officials were recognized earlier today at the Legacy Senior Living Ceremonial Grounding Breaking for the new assisted living and memory care facility. Cleveland's new Senior Citizens Advisory Committee held its first meeting on April 20. The City of Cleveland is hosting a working luncheon about pedestrian and bicycle infrastructure on Friday February 24, 2017 from 12:00 PM to 3:30 PM at the Cleveland Public Library, 795 Church Street NE. Earlier today Mayor Rowland held a joint press conference with the Tennessee Housing Development Agency (THDA) announcing a new grant program offered for Cleveland Residents. Tennessee Senate Majority Leader Mark Norris (R-Collierville) toured Cleveland High School Tuesday morning. The visit was part of a day-long tour of Bradley County. Mayor and City Council invite you to attend one of the public information meetings listed below for more information about the survey and upcoming city projects. City offices will be closed Monday, January 16, 2017 in observance of Martin Luther King Jr. Day. Mayor Rowland with Cheer Coach, Megan Carroll, and the Cleveland Middle School cheerleaders at Operation Christmas Child helping spread Christmas Cheer! The Cleveland Fire Department is hosting it's annual career showcase on Dec 6 from 6:00 to 8:30 pm. Individuals will have the opportunity to meet and speak with fire department staff about the requirements and opportunities for employment. The city of Cleveland honored our local veterans at the 2016 Veterans Day Ceremony at the Bradley County Courthouse Square. VITA (Volunteer Income Tax Assistance) program is need of volunteers. Please click the additional info link for information about how to become a volunteer. Cleveland Police Department Lieutenant Earns Ph. D. in Information Technology. The week of September 17 - 23 is U.S. Constitution Week across the nation. Mayor Tom Rowland recently signed a proclamation to observe the week locally as well. Four members of the Cleveland City Council took their oaths of office Monday and began four-year terms. The City's newly elected leaders will be sworn-in today at 3:00 PM at the Museum Center at 5ive Points. The Blythe Oldfield neighborhood recently celebrated the renovation of a playground at the Blythe Family Support Center and relocation of Early Head Start classrooms with a ribbon cutting ceremony. The city of Cleveland's financial staff has been awarded the Certificate of Achievement for Excellence in Financial Reporting from the Government Finance Officers Association. Parents of new Lee University students packed Dixon Hall last Saturday to hear about Cleveland. A land donation by the Allan Jones Foundation has been accepted by the city of Cleveland to expand the site of the future city park at Taylor Spring. Life Force One was officially welcomed to its new base in Cleveland today. A ribbon cutting ceremony was held at the new Life Force hangar and crew quarters at the Cleveland Regional Jetport. Cleveland is one of the top areas in Tennessee least affected by inflation, according to the finding of a new survey. The Cleveland Fire Department unveiled its newest rescue apparatus during Monday's city council meeting. Governor Bill Haslam has announced the City of Cleveland has been selected as a recipient of the 2016 Local Parks and Recreation Grant from the Tennessee Department of Environment and Conservation (TDEC). The city of Cleveland is the recipient of a $50,000 grant to assist with tourism infrastructure assets. The city is currently in the process of redesigning its website. We are seeking high resolution and high quality pictures that will be featured on our home page and throughout the site. Help us out by showing what an incredible place Cleveland is! 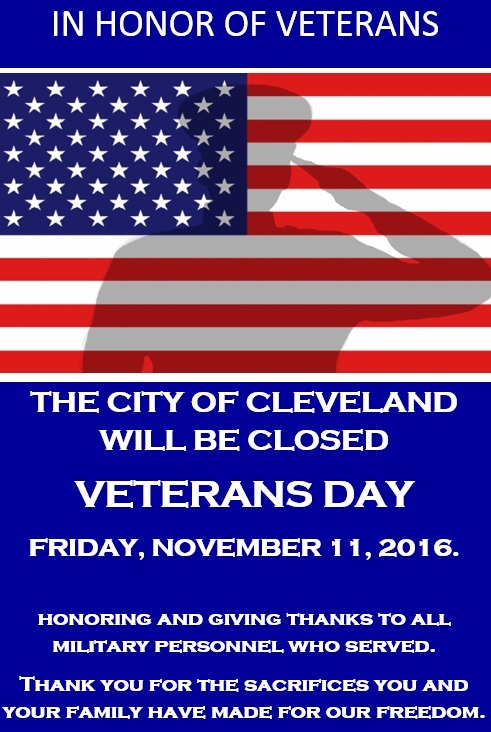 Cleveland City Hall offices will be closed Monday, July 4 in observance of Independence Day. The Cleveland City Council has unanimously approved a contract with Joe Fivas as the next city manager. The City of Cleveland Animal Shelter Advisory Board meeting scheduled for Wednesday, July 6th has been cancelled. The Cleveland Regional Jetport will have a new fixed base operator, effective July 1. Cleveland City Council members have completed their interviews with the four finalists seeking to become Cleveland's next city manager. Today we honor and celebrate the life of Cleveland Police Department Officer Justin Maples and the ultimate sacrifice he made for the City of Cleveland. participation by 367 Cleveland and Bradley County households on Saturday. The event was held for the first time at the Bradley County Justice Center. The City of Cleveland in partnership with the Museum Center at 5ive Points is one the recommended recipients selected for the National Endowments for the Arts Our Town program. Five names were selected Friday by a citizens advisory committee to send to the Cleveland City Council for consideration as the next Cleveland city manager. Cleveland has received its 24th Tree City U.S.A. award. The National Arbor Day Foundation recognizes Tree Cities annually. The local ceremony took place Tuesday beside the greenway at 20th and Keith streets. Former and current students, teachers, coaches and administrators of Cleveland High School joined together Sunday afternoon to officially open the new Raider Arena. The Cleveland Fire Department conducted its inaugural American Flag Retirement Ceremony on Saturday at Veterans of Foreign Wars Post 2598 on North Ocoee Street. Congratulations Vice Mayor George Poe for being selected by Cleveland State Community College as their winner for Public Service.